Sally began working at Aaron's Jewelry in 1998. She is the daughter of owners Jay and Mitzi Fluckiger and granddaughter to our founder Aaron Dean Fluckiger. Sally worked exclusively as a Sales Associate until roughly 2003 when she married John Wintle and began designing custom jewelry and carving waxes for the store. She has designed numerous one of a kind pieces over the years including the crown worn by Miss Rodeo Hooper which debuted August 2012. 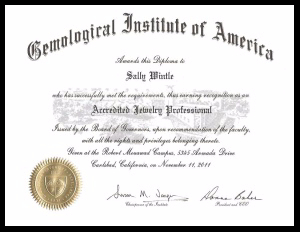 In 2011 Sally graduated as an Accredited Jewelry Professional from the Gemological Institute of America. Sally's design ability and knowledge of the industry are unmatched in Northern Utah. Being raised in the jewelry industry has unquestionably given her an edge over the competition and her passion for unique and beautiful jewelry is showcased in all of her custom designs. 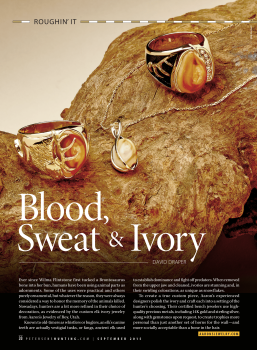 Some of Sally and John's custom Elk Ivory Jewelry is featured in Petersen's Hunting magazine September 2015 issue.